So who is Johnny Mason and what the heck does he know? Well, I'm just a guy born and bred in Flint, Michigan who happens to find honey bees fascinating. In fact, the more I learn, the more intrigued I get. I'm not a master beekeeper by any stretch, and being a life long learner, I find the title "master" to be a limiting one. Can anyone truly be a master of anything? There's always so much more to learn! As has been said before, one of the best ways to learn is to teach, so here I am. 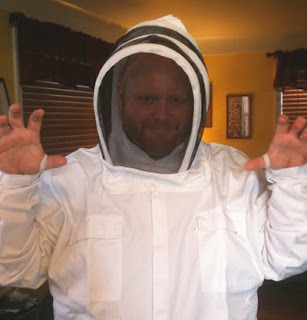 I'm always researching things, picking the brains of fellow beekeepers (mostly my pal Jim), and sharing my knowledge with those that care to hear (or in this case, read) me ramble on. Anyway, I'm glad that you stopped by. Stay tuned for the continuing adventures of an urban beekeeper. By the way (insert shameless plug here): If you have an Android phone, you should check out the app I made called "Beekeeper Hub" in the Android Market. If you're interested in some of rather fascinating visual aspects of my city Flint, Michigan, maybe buy my book, "Flint: In The Details".